Whether you’re interested in a simple patio, or one with all the bells and whistles, Paverscape Inc. can make your backyard dreams a reality. Our expert designers will come to your location for a free consultation and create a design that blends your ideas with the features of the property. Our professional staff will hand select any plant material and expertly install your project from start to finish. The result will be an outdoor living area that you and your family can enjoy for years to come. 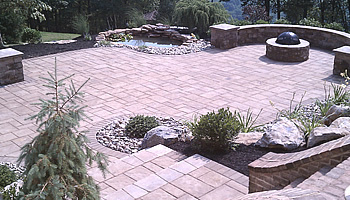 Hardscaping requires little in the way of maintenance and the pavers resist stains and spills. 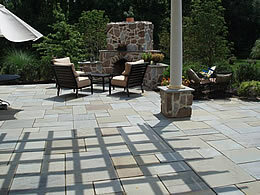 Pavers come in various shapes, colors and surface finishes, and unlike concrete, can be replaced if necessary. 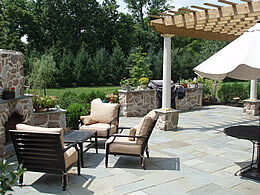 A hardscaped patio is durable and the beauty will last a lifetime. 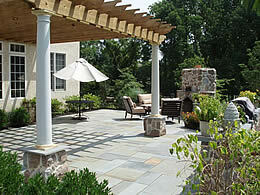 Here is an example of a Natural Flagstone or (Blue Stone) Patio, with each piece hand selected. The homeowner chose a treated wood Pergola, with PVC Columns so that it could be stained to their color of choice. We also incorporated a custom veneer stone fireplace and grille/bar area to match. Lehigh Valley - Fogelsville, PA.
Backyard revitalization project. Techo-Bloc Athena Paver patio with fire pit, sitting bench, and light pillars. EP Henry Coventry Paver Patio using Harvest Blend Circle kit. Includes sitting wall and light pillars. Techo-Bloc Inca Paver Patio with mini creta, sitting wall, and outdoor lighting. Techo-Bloc Aged Blu 60 Paver Patio with Victorian Border and pillars. Techo-Bloc Athena Paver Patio in Harvest Gold with Parisian paver border and Valencia fire pit. Techo-Bloc Athena Paver Patio with custom Antika Paver inlay. Mojave Reige sitting wall and boulder steps. Techo-Bloc Blu Paver Patio in Harvest Gold with border, sitting wall and fire pit.